Work on your mechanics to speed up your pitches. Modified softball pitching is something of a compromise between a slow-pitch softball lob and a windmill fastpitch delivery. If you’re a modified pitcher, you can’t whip your arm in a 360-degree motion, but you’re allowed to bring your arm back to shoulder level -- or even higher, if you’re flexible enough -- then throw the ball as hard as you can. If you’re not completely satisfied with your modified fastball, keep working on your technique so you can blow those pesky hitters away. Warm up properly before you pitch. Your muscles work better when they’re warm and flexible. Perform dynamic stretches for your arms, shoulders, abdomen and legs. When you begin pre-game throwing, warm up gradually until you reach game velocity. Bring your arm back as high as possible when you pitch. Perform flexibility exercises to increase your shoulder’s range of motion if you can’t take the ball back over your head. The farther back you bring the ball, the longer your delivery and the faster you’ll throw. Stride forward as far as you can when you deliver the ball, while still remaining on balance. As a rule of thumb, your stride length should equal or exceed your height. Push off the rubber with your back foot. Most of your pitching power derives from your legs, so thrust yourself forward with your back leg when you’re releasing the ball. As always, however, make sure to retain your balance. All the speed in the world won’t matter if you can’t throw strikes. Perform wrist exercises to improve your delivery’s wrist snap. Throw to a teammate standing about 12 to 15 feet away by holding your arm steady at your side and only flicking your wrist. 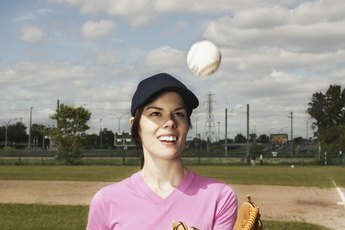 Throw about 15 to 20 pitches with a weighted softball several times each week -- but never on two consecutive days -- to help build your throwing muscles. Do Arm Circles Help You Throw Faster?